The laboratory provides 3000 m2 (32,300 ft2) of experimental space built around four exhaust hoods (1 MW, 3 MW, 10 MW, and 20 MW) connected to an Emissions Control System to treat smoke and combustion products. The exhaust system is part of an oxygen consumption calorimeter that allows the measurement of fire heat release rate. 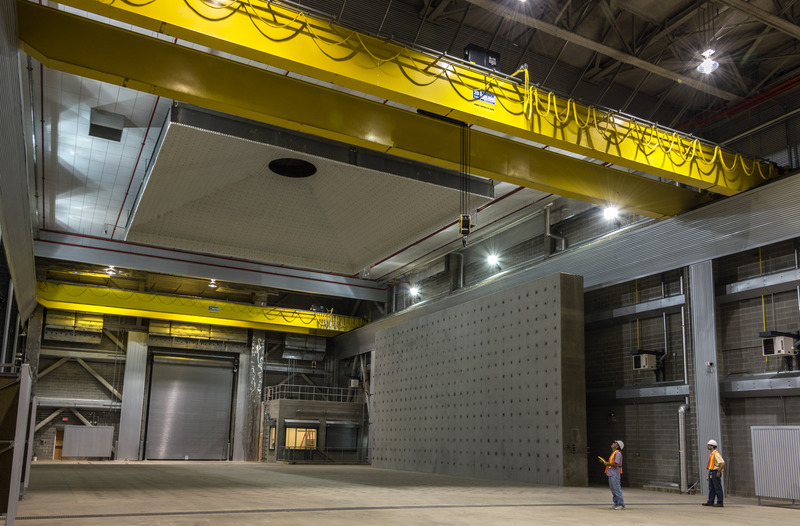 The original high-bay, which was completed in 1973, houses the 1 MW, 3 MW, and 10 MW exhaust hoods and provides a flexible workspace that can meet a variety of experimental fire research needs. The facility was expanded in 2015 to include a second large high-bay test area that provides a 18.3 m × 27.4 m (60 ft x 90 ft) strong floor and a 9.1 m × 18.3 m (30 ft x 60 ft) strong wall to allow for controlled structural loading underneath an exhaust hood that can accommodate fires with sustained heat release rates up to 20 MW. Two 18.1 metric ton (20 ton) bridge cranes facilitate the construction and moving of large structural members. The video below provides an overview of the facility. Detailed technical specifications for large high-bay test area are provided in an article in Fire Technology. Visit the Fire Risk Reduction in Buildings Program webpage to learn more about NIST's work to improve fire protection and reduce direct fire losses in the United States.